Believe it or not, dogs are the latest weapon being used in the fight against bed bugs. Bed bugs are small, oval-shaped, flat insects that can be hard to detect. The nose of a bed bug dog has the ability to sniff out as little as one live bed bug or just one viable bed bug egg. The reason for this is that dogs have somewhere between 20 to 40 times the number of nasal receptors as humans, making it easy for them to detect even the faintest of odors. For years, dogs have been used by the military and law enforcement agencies to detect illegal drugs, bombs and even aid in the search and rescue of lost children; so why use them to detect bed bugs? Speed and Accuracy: Bed bug detection dogs generate quicker, more accurate results than conventional bed bug detection methods saving time and money for homeowners, businesses and insurers. The Nose Knows: A dog’s nose is the latest technology in bed bug detection. The moist leathery surface of their snout acts like velcro catching the smallest molecules of smells and it is the only bed bug inspection tool able to isolate the scent of bed bugs. This is very important for lowering removal costs. Reliability: Because of the working record of dogs with the military and law enforcement agencies, they have proven themselves as trustworthy, reliable workers in the fight against bed bugs. Pease of Mind: There is a peace of mind in knowing that if a bed bug dog finds bed bugs in your home or business you should investigate the problem further, but if the dog doesn’t detect any bed bug activity, you can be reassured that your property is bed bug free. While people work for money and prestige, a dog works very hard for food and love. These rewards are what makes the dog an extremely loyal worker. 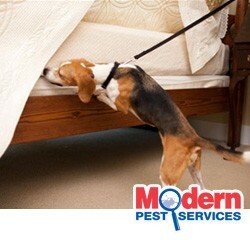 As you can see with the right training, “man’s best friend” can be a very valuable member of any pest control team. The Modern Pest Services’ team is anxious to welcome its first bed bug dog, now being trained at the J&K Canine Academy in Florida.